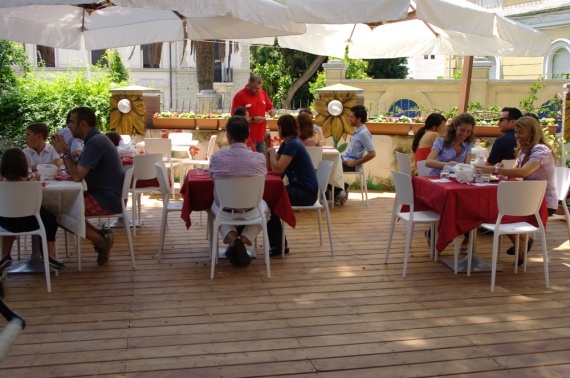 The Ristorante dei Buoni e Cattivi (the restaurant of Good and Evil) is located in a beautiful villa with garden and enjoys a large open terrace. The Restaurant dei Buoni e Cattivi is based on the rediscovery of the traditional Sardinian flavours, it suggests a creative high-quality Cuisine with bio products of our Land which follow the seasons. It offers a creative menu that combine. A tasty cuisine, rich in flavor, rewarded for the second year with prestigious awards like Premio Buona Cucina 2014 by Touring club Italia. The Gambero Rosso food guide gave us the award for the best value for money 2014 recognized only for 8 restaurants in Italy. We are also included in the guides Locande d'Italia of Slow Food, Ristoranti d'Italia of L'Espresso and Bibenda. Open every day with different formulas , from Monday to Friday for lunch you can find proposals with fixed price menus and à la carte. In the evening , from Thursday to Saturday , the proposals will round off with mouth-watering dishes and à la carte selections of season at a fixed price . On Sunday , the restaurant offers Sa Picchettada a lunch buffet full of original dishes to be enjoyed in a relaxing atmosphere . On the first floor of the villa, take place the guest house with 5 spacious and comfortable rooms , all with private bathrooms , which have preserved the original style of the house.